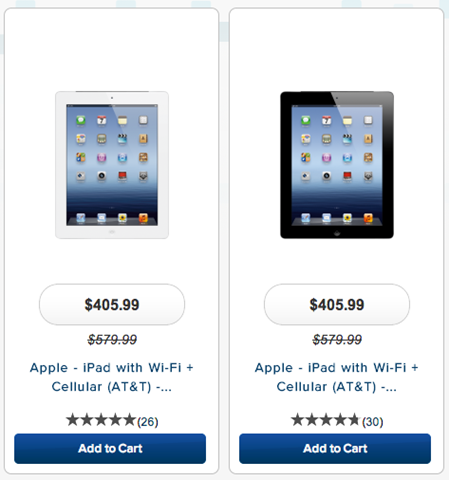 Best Buy are offering heavy discounts on various iPad 3 models this week. As 9to5Mac reports, current deals at Best Buy offer up to 30% off standard retail prices. One of the most enticing deals will let online shoppers get their hands on a 16GB Wi-Fi only model for just $314. A 32GB Wi-Fi only model is available for as low as $384 ($165 off retail). On Wednesday, Wal-Mart (WMT), Best Buy (BBY) and MacMall initiated clearance sales, reducing their 3rd-generation iPad and current iPad mini prices roughly 30% across the board — a pretty good sign that Apple is about to replace the old models with new ones. I would not be at all surprised to see a new iPad release as early as this month, as I’ve mentioned before when talking about the possible move to 6 month refresh cycles for the iPad. But I expect and hope that Apple will hold off releasing a new iPad mini until they can add a retina display to it – and all the latest leaks / rumors I’ve seen on that topic suggest that’s not likely to happen until towards the end of this year. It would be great to see a new iPad that borrows a bit from the iPad mini though. If we are going to see that this month then we should see one of those lovely Apple event invites issued over the next week or two.